Anne Frank was born on this day in 1929. She would have been 83. 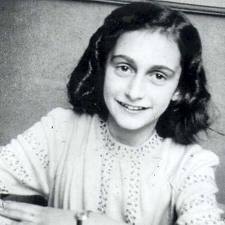 Anne, of course, was one of the millions of victims of the Holocaust in Europe in the 1930s and 40s. She and her family hid in the secret annex of a business her father once owned (and later managed) in Amsterdam. Anne kept a diary detailing their time in hiding. On August 4th, 1944, after 2 years in hiding, the eight people living in the Annex were arrested and taken to concentration camps. Otto, her father, was the only one who survived. He returned to the Annex and eventually was able to get Anne’s diary published. The diary has been published as book, made into a Pulitzer and Tony Award winning play, movie and television drama. Here is a nice page by the Anne Frank Museum where you can learn more about Anne’s story. This entry was posted on Tuesday, June 12th, 2012 at 12:15 pm	and tagged with AnneFrank, Holocaust and posted in Anne Frank, Thought of the Day, World War Two. You can follow any responses to this entry through the RSS 2.0 feed. @ Kate… agreed. I think Anne Frank is, for many of us, the first glimpse of the Holocaust … and she puts such a human face on the tragedy. I can remember reading the Diary as a girl. It really changed the way I saw/see the world.